Modest yet articulate, Iqbal Chagla is not a person prone to talking about his success or measuring it. His fame and success lie in his completing 50 fulfilling years in the legal profession, which was felicitated in Mumbai. “I don’t count my success with the number of cases won or awards I got or even the honorary doctorate, but in the warmth, affection, loyalty and outstanding ability of my juniors and the people I have been with all these 50 years. I bask in their glory,” he elucidates. And some of his juniors are eminent names of the legal world such as the Maharashtra Advocate General, Darius Khambata, and Senior Counsel, Janak Dwarkadas. “Sometimes I am at the receiving end from them in court,” he smiles. The illustrious Chagla enrolled in the Bar in 1963, was invited to be Senior Advocate by the Bombay High Court in 1978 got an honorary degree of Doctor of Laws from Berhampur University, Odisha, on 2 May 2012 and was President of the Bombay Bar Association for three consecutive terms, from 1990 to 1999. On his beginnings, Chagla says his inspiration has been his father, Mahommedali Currim Chagla. “I had very large shoes to fill when I came back as a barrister from London. I basked in his glory then and his achievements were my inspiration. Looking at his milestones, I feel great pride at what he did and I always wanted to emulate his values.” Mahommedali Currim Chagla was a well-known jurist, diplomat and Cabinet Minister who served as Chief Justice of the Bombay High Court from 1948 to 1958. M.C. Chagla served as Indian Ambassador to the USA from 1958 to 1961 and then as Indian High Commissioner in the UK from 1962 to 1963. On his return, he was asked to be a Cabinet Minister and he served as Education Minister from 1963 to 1966. He then served as the Minister for External Affairs of India form 1966 to 1967, after which he left government service. His father did not like to be addressed as Chief Justice after retirement. He wanted people to call him ‘Mr. Chagla.’ “My mother was a humble, loving woman and my father’s positions did not turn her head. She was not very well educated but was warm to everyone,” he says. The couple has two children – son, Riyaz and daughter, Rohiqa. Riyaz is also a lawyer and married to Nilufer. Rohiqa is married to Cyrus Pallonji Mistry who was the Chairman of the Tata Group. “We have four grandsons. Rhoiqa’s sons, Firoze and Zahaan, are studying in Geneva. Riyaz’ sons, Rehan and Zaheer, are in Mumbai with us,” say Chagla and his wife. There’s lot more to the man who was offered judgeship of the Supreme Court by the then Chief Justice, J.S. Verma. 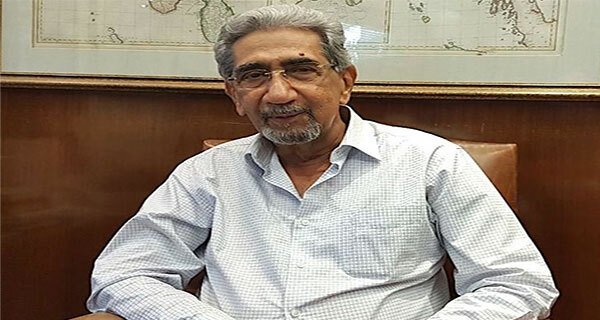 “In a short tenure of one and a half years, I could not have done a lot to bring about much change, so I decided to stay in Mumbai,” he elucidates. On the current judicial system, Chagla feels that judges should be given more emoluments. Their salaries should be tax-free so that their economic status is raised and with more incentives more capable people would accept judgeship in the future. A trumpet at home, gifted by his wife on his 50th birthday, says, “Now that you are 50. You can blow your own trumpet,” but Chagla still likes to keep a low profile and continue working.